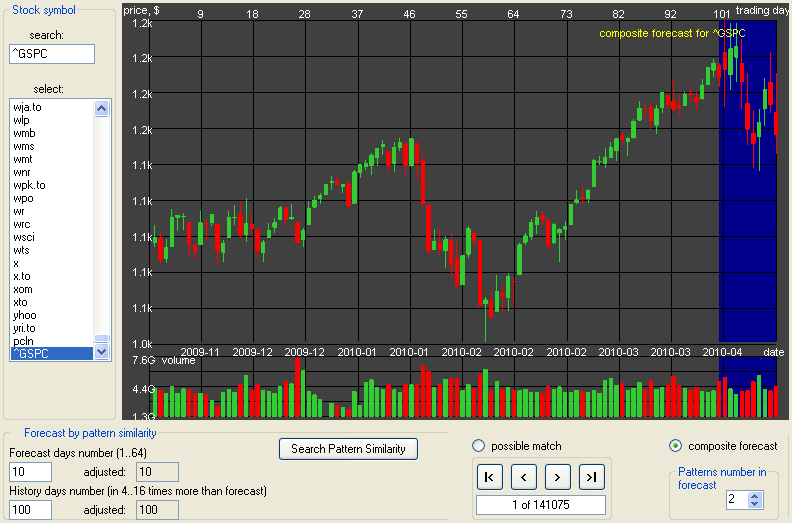 Pattern Prediction Worked This Time – Is Stock Market Predictive? The question is if we can trust and use the only one such prediction for investing. Pattern recognition system is based on the statistical classification of patterns assuming that the patterns are generated by a probabilistic system. “Probabilistic” means that sometimes an expected thing happens, sometimes does not. Yes, some patterns can be repeatable in the future, therefore, the selected present patterns can be used to predict the future pattern. However, statistics evidence that the prediction can be wrong. political event, published news, investors’ psychological reaction to news or event, etc. If we try to calculate the value of “patterns” predictive factor, it might be a relatively small amount – around 20-40%. So that it is wise to analyze information from multiple sources to make a more comprehensive conclusion. There is always a risk involved in stock investing. In fact, historically a stock market crash is a result of combination of all factors – short, medium, and long terms, predictive and non-predictive. “Non-predictive” means – there is no way to know for sure about this in advance. A pattern recognition system is to classify data based on statistical information excerpted from the data. Normally, a pattern recognition system consists of data input, converter, an extraction processor to classify accordingly to descriptive scheme, and output grouped data. The statistical classification of patterns assumes that the patterns are generated by a probabilistic system. Some patterns can be repeatable in the future, therefore, we can use selected present patterns to predict the future pattern. Investment Analyzer InvAn-4 (IA) by Addaptron Software has an extra feature to predict stock or index prices using pattern similarity. The prediction period can be chosen within a range 1..60 trading days; the period of historical data that used for matching recommended in 4..16 times longer than prediction period. IA searches for the best matches by scanning all historical data from the internal database. IA ranks all possible matches on the basis of maximum correlation and minimum deviation within given historical period. IA performs pattern matching using open, high, low, and close prices and volume data. When scanning is completed, IA composes forecast using several best matched patterns (top ranked). Since the statistical regularities of the patterns help to create more stable picture, IA allows adding up many top-rated patterns. The composite result is built as a weighted average with weights proportionally pattern ranks. Pattern recognition systems are able to classify data based on statistical information extracted from the patterns. The patterns should be classified in order to extract useful information. Normally, a pattern recognition system consists of the input, data converter, an extraction processor to classify accordingly to descriptive scheme, and output grouped data. The most popular systems are based on statistical pattern recognition, i.e., statistical classification of patterns, assuming that the patterns are generated by a probabilistic system. If we assume that some patterns are repeatable in the future, we can use selected present patterns to predict the future ones. 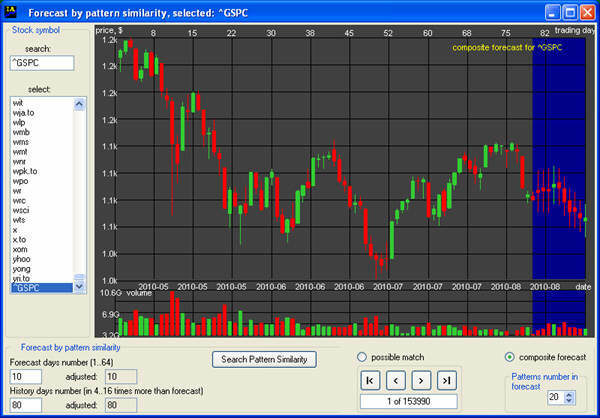 Investment Analyzer (IA) by Addaptron Software has an extra feature to predict prices of the selected stock (index) using pattern similarity. The prediction period can be chosen from 1 day to around 60 trading days; the period of historical data that used for matching should be in 4..16 times longer than prediction period. IA searches for the best match from the internal database by scanning all historical data. IA ranks all possible matches on the basis of minimum deviation and maximum correlation within given historical period. IA performs pattern matching using open, high, low, and close prices and volume data. When scanning is completed, IA composes forecast using several best matched patterns (top ranked). Since the statistical regularities of the patterns help to create more stable picture, IA allows adding up many top-rated patterns. The composite result is built as a weighted average with weights proportionally patterns’ ranks. 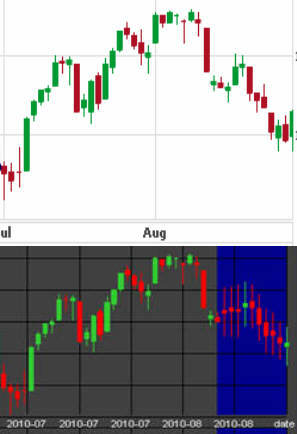 The number of patterns that form composite forecast can be adjusted; the number range is 1..99.